Background: The Green Frog (Lithobates clamitans) has many similarities to the better known American bullfrog (Lithobates catesbeianus). Both are exotic species (i.e., non-native, introduced) in the Pacific Northwest, originally found in eastern North America, but deliberately and accidentally spread far beyond their native ranges. Both are highly aquatic and flourish in warm water environments, although both have proven to be adaptable in areas with colder water. The Green Frog also physically resembles the American Bullfrog in appearance, but is smaller in maximum size. Introduced populations of this species have not – to date – spread as rapidly nor had the obvious detrimental effects on native species as American Bullfrog. However, the role of introduced Green Frogs on our local ecosystems has not been well-studied and this species should be regarded as a potential threat to native frogs. The origin of introduced populations of Green Frogs are not well-documented (e.g., did these frogs come from northern or southern populations in the east, or both? When, why, and by whom were they introduced?). Similarly, the mechanisms by which this species spreads after initial introduction are largely unknown. Adult and Juvenile Description: This is a medium-sized (females to about 4 inches body length and males to about 3.5 inches), stout, true frog that ranges in color from green or olive to brown, often with a few or many black spots and a light to dark green jaw stripe. Besides relatively smaller size, the best way to differentiate Green Frog from American Bullfrog is the distinct dorsolateral folds extending from the back of each eye to midway down the back, which is absent in American Bullfrog. Green Frogs are sexually dimorphic, with males having a large tympanum (i.e., ear drum) twice as wide in diameter as the eye (equal in diameter in females) and a yellow throat (cream-colored in females). Adult male Green Frogs are territorial during the late spring-summer breeding season. The advertisement call is a single bass note that sounds like the loud twang of a plucked banjo string. Larvae: Tadpoles can grow to about 8 cm in length. They are olive green and have dark speckles on the dorsal side and on the tail. The belly is a creamy color. 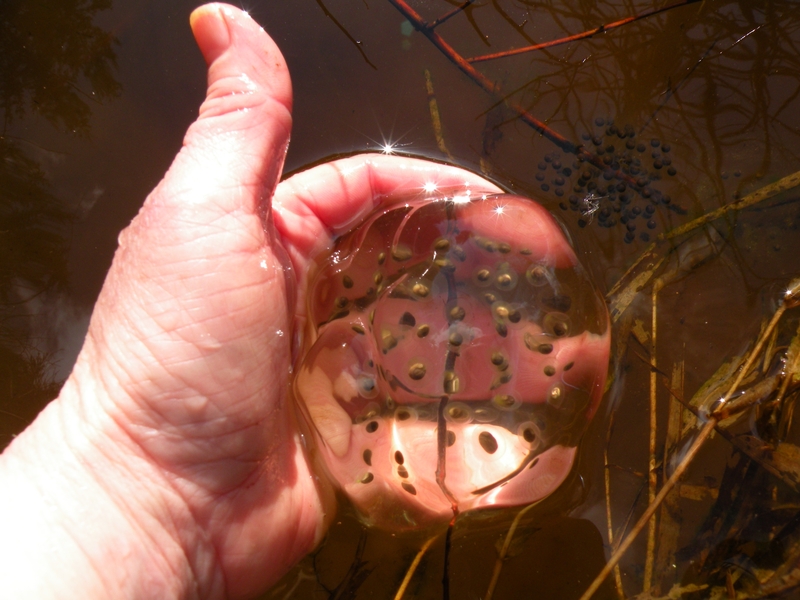 Depending on the time of breeding and water temperatures, tadpoles may metamorphose in the same year or will overwinter to metamorphose in their second year. Eggs: Eggs are laid throughout the summer months. Much like the bullfrog, this species lays poppy seed sized eggs in a thick layer of jelly that lays on the surface of the water. As the eggs get closer to hatching the mass begins to sink lower under the surface of the water. Freshly laid eggs are black on the topside and white on the bottom side. Habitat: Green Frogs are generally associated with permanent bodies of standing or slow-moving water. Introduced populations occur at ponds, lakes, and deep ditches with ample emergent and aquatic vegetation cover. Green Frogs coexist well with fish. They are often found in dense aquatic vegetation in the water or on amongst the vegetation on banks. Distribution in Whatcom County: Green Frogs have long been known to occur at Toad Lake, where they were evidently introduced more then 100 years ago. Other occurrences were documented by WCAMP volunteers in 2016 at Tennant Lake, Bug lake, and Sunset Pond, and there are undocumented reports of Green Frogs near Bellingham International Airport. More surveys and citizen reports are needed to fully understand the species’ distribution in Whatcom County.